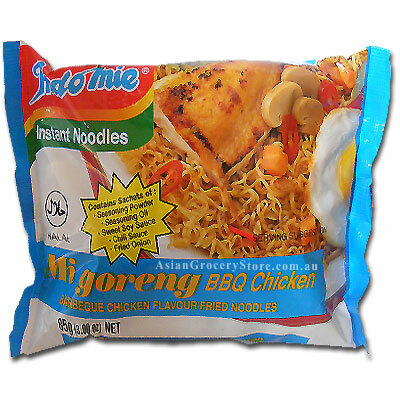 Minimum quantity for "Indo Mie Mi Goreng BBQ Chicken Flavour Fried Noodles" is 5. Noodles : Wheat Flour (66%), Refined Palm Oil (Contains antioxidant 319), Tapioca Starch, Salt, Mineral Salts (501,500), thickener (412), Colour (101). Seasoning Oil: Refines Paml Oil (Contains antioxidant 306), Onion, Garlic, Herbs, Acidity regulator (330). Chili Sauce : Water, sugar, salt, tapioca starch, acidity regulartors (260, 330), flavour enhancers (621, 631, 627), garlic flavour, preservitive (211).